Interested in asking your students to record their initial thoughts about a text? Tired of grading massive packets of reading logs during a book pass and want a one-page response from your students trying out a new book? Then this resource is for you! 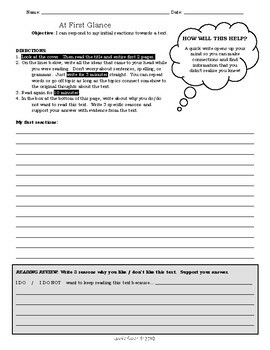 With guided directions at the top and ample room to compose initial responses to the text, this one-page worksheet will provide structure for students who are browsing new books in your library.